Family law paralegals, like all paralegals, work with attorneys and judges to find the laws that assist in resolving the issues in a legal dispute. Paralegals are not attorneys and are specifically prohibited from engaging in certain legal activities, such as setting legal fees or providing legal advice. The general term "paralegal" derives from these professionals' position of working alongside attorneys. A paralegal's career consists of two main tasks: researching applicable laws and gathering information about a case. The first task consists of providing attorneys and judges with case laws, statutes and other established rules relevant to the issues in the lawsuit. 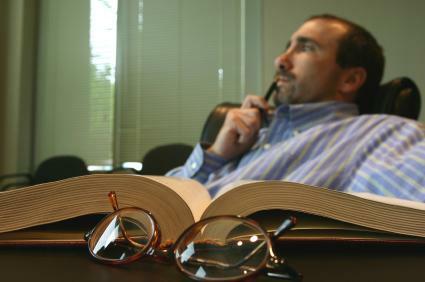 Paralegals interpret laws only to determine their pertinence to their case and not to develop arguments. The second task refers to interviewing witnesses and clients and collecting evidence, such as paperwork, necessary to properly prosecute the case. These tasks mean that the majority of a paralegal's day is spent researching. Paralegals use online legal databases, books and other resources to search for applicable laws. Research is also required to determine who to interview and how to interview them as well as what documents are necessary and how they are obtainable. It is this research that differentiates paralegals from legal assistants. Those who work as assistants to attorneys solely perform administrative tasks. Although some paralegals work for courts, the majority are employed in private offices. Typically, a paralegal is assigned to assist one or more attorneys within the firm. The attorney instructs the paralegal about what to research and what other information they require for a case. Paralegals usually work a regular, 40-hour work week, but may need to work more to support their assigned attorney. A 2010 Bureau of Labor Statistics report stated that paralegals earned an average of $50,000 per year in 2008. This amount, however, is often higher for paralegals who work in large, private law firms. Family law is a field of law dealing with child custody and support, juvenile delinquency, divorce and other, similar issues. Many states have dedicated family law courts which only deal with these topics. A state's legislature establishes family law courts and determines which topics it handles. Family law paralegals work solely on family law issues. Their research and investigations, therefore, focus on family law topics. While working in family law is considered a specialization, there is no special training, licensure or certification to work as a paralegal in the field; entering into the specialty is as easy as accepting a job. While some employers may train paralegals on the job, many prefer paralegals with degrees or certificates. The majority of paralegals possess either an Associate of Applied Science in Paralegal Studies or a Certificate in Paralegal Studies. Associate's degree programs consist of two years of study in paralegal and general education courses. Certificate programs may require up to a year of classes and do not include general education coursework. Paralegal topics taught in both programs include research methods, personal injury law, civil and criminal procedure, professional conduct and legal writing. The American Bar Association (ABA), which governs the practice of law throughout the nation, approves paralegal training and degree programs. Graduation from an ABA-accredited training program is not required to work as a paralegal, but may make it easier to find employment. Paralegals are generally not required to be certified or licensed, but voluntary certification is available and may increase employment opportunities. Certification is usually obtained by passing an exam. The National Association of Legal Assistants (NALA), American Alliance of Paralegals (AAP), National Federation of Paralegal Associations (NFPA) and the National Association of Legal Secretaries offer paralegal certification. Family law paralegals can specialize in the field by completing NALA's Advanced Paralegal Certification program, which includes a final exam. A career as a paralegal in the field of family law can be rewarding, lucrative and - believe it or not - quite fun! Because no two cases are ever the same, paralegals rarely perform the same research twice, making for very few boring days at the office. With good hours and income, and most likely also benefits, a paralegal career might be right for you!